NEW DATE: Saturday, Oct. 20, 9 a.m.-5 p.m.
(RALEIGH, N.C.) — Crawfish, crawdad, mudbug, yabby. These all are names for one charismatic critter: the crayfish. The North Carolina Museum of Natural Sciences is home to one of the largest crayfish collections in the world, with more than 60,000 specimens. 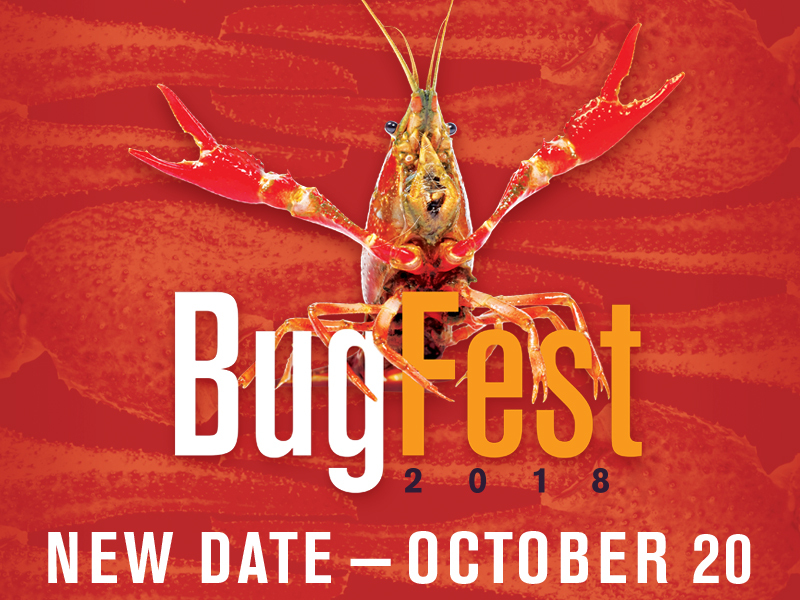 But why are crayfish featured at BugFest this year? Regardless of the name, this event celebrates all arthropods, a group that includes insects (like butterflies and beetles), arachnids (spiders and scorpions), myriapods (centipedes and millipedes) and crustaceans (where the crayfish belong), as well as true bugs (like cicadas and planthoppers). Come find out how large and diverse the arthropods can be as the Museum hosts the 23rd annual BugFest, Saturday, October 20, 9 a.m. to 5 p.m. This free event, the largest one-day bug-centric event in the country, introduces visitors to a range of arthropods from North Carolina and around the world. You’ll see Mexican red-rump tarantulas, Madagascar hissing cockroaches and Asian tiger mosquitoes, as well as wolf spiders, emperor scorpions, tarantula hawks and much more. Throughout the day, BugFest offers bugs and bug experts, games and activities (like the Stag Beetle Battles and Roachingham 500), live music, movies and presentations to entertain and educate the entire family. If looking at all these insects makes you hungry, you can grab a plate of unique food at the Café Insecta, where local restaurants offer a variety of free bug-filled fare ranging from Live Bait Banana Brûlée to Meal Worm Arancini. Eating bugs might sound weird, but not eating bugs is even weirder. Whether it’s Mexican agave worms or South African locust porridge, bug-filled dishes have found their way into the culinary palates of up to 80 percent of countries on Earth. And yes, they’re good for you. Whole insects are high in fiber, protein and omega-3 fatty acids. BugFest is brought to you by Terminix Companies of Eastern North Carolina and BASF. For more information about the event, including a complete list of presentations, exhibits and activities, visit bugfest.org.